When I hear a ‘ukulele playing, I can’t help but think about Hawaii. No matter where I am, images of Hawaii, of palm trees and mountains and calm oceans, come into my head. A ‘ukulele is an instrument with four strings. Hawaiians adapted the ‘ukulele from the Portuguese machete, a guitar-like instrument that Portuguese immigrants brought to Hawaii. With origins all the way back in the 1800s, today, ‘ukelele music is synonymous with Hawaii. The first and largest ‘ukulele festival will be paying tribute to the late Eddie Kamae, a legendary Hawaiian musician. Kamae touched the lives of musicians, ‘ukulele enthusiasts and Hawaiian music lovers around the world. It is free and open to the public. Kamae, who passed away earlier this year, was one of the most influential Hawaiian musicians of the last half-century. His work perpetuated the culture and history of the islands. This year, more than 20 world-class musicians and acts will come together to celebrate both the ‘ukulele and Kamae as the musical icons of aloha at the 47th Annual Ukulele Festival Hawaii on Sunday, July 16, 2017, from 10:30 a.m. to 5 p.m. at Kapi‘olani Park. Both local talent from Hawaii and international entertainers, who will be traveling from various destinations throughout Asia, Oceania and North America, will be performing. Under the direction of festival founder and ‘ukulele master teacher Roy Sakuma, Kamae’s famous melody “E Ku‘u Morning Dew” will be played by the Ukulele Festival Band. Today, the annual Ukulele Festival at Kapiolani Park Bandstand in Waikiki is now a summer tradition in Hawaii. It has grown internationally and is by far the largest ukulele festival of its kind in the world. It attracts crowds of thousands, guest artists from around the world and an ukulele orchestra of over 800 students, mostly children. 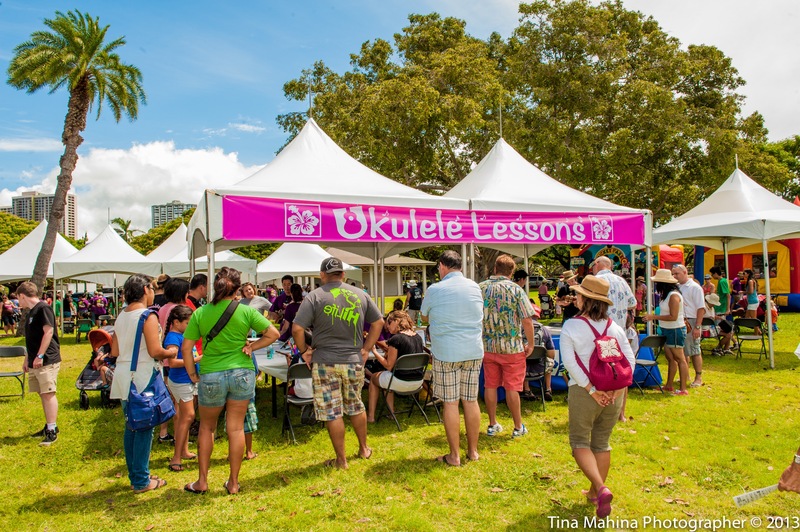 In response to popular demand and the ukulele renaissance in Hawaii and throughout the world, Ukulele Festival Hawaii, with the support of sponsors, has taken the ukulele festivals on the road to the islands of Hawaii (Waikoloa), Kauai and Maui. The 12th Annual Maui Ukulele Festival will take place on Sunday, October 15, 2017, from 1:00 p.m. to 6:00 p.m. at the Maui Arts & Cultural Center. The 18th Annual Waikoloa Ukulele Festival on the Big Island is already set for Saturday, March 3, 2018, from 11:15 a.m. to 6:30 p.m. at Waikoloa Beach Resort. 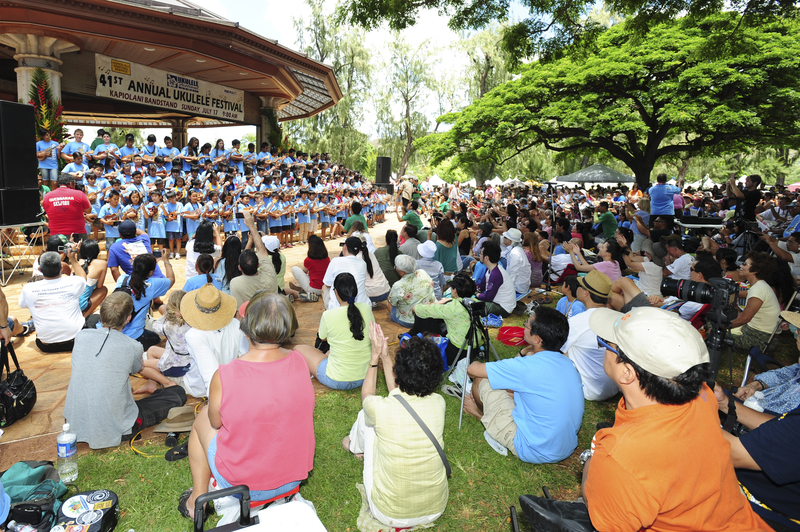 Ukulele Festival Hawaii invites both visitors to the islands and residents to attend this event. Tony Group Autoplex will present Ukulele Festival Hawaii. Hawaii Tourism Authority also provides support. More than 10,000 people will attend this year’s event. Attendees will get to enjoy the musical stylings of this year’s featured artists, including Ohta-San, Willie K, Herb Ohta Jr., Beat-Lele Mania, Nick Acosta, Kamakakehau Fernandez, Manoa DNA, Kamehameha Schools Performing Arts Academy Ukulele Ensemble, and the Roy Sakuma 700-piece ‘Ukulele Band composed mostly of children. In addition, Danny Kaleikini, Hawaii’s Ambassador of Aloha, will serve as emcee for the 46th straight year. In addition, out-of-town performers include the North Virginia Ukulele Society (U.S.), Ukestralia (Australia); The Langley Ukulele Ensemble (Canada); Artcourse (China); fulare_pad, Nihon Ukulele Association, Ryo Natoyama and Yamaha Music School of Ukulele (Japan); Ukulele Heaven (New Zealand); and Apollon Ukl Ensemble (Korea). Free parking and shuttle service in air-conditioned buses from Kapi‘olani Community College to Kapiolani Park and back will be available. A second stage in the food tent will allow more performance time for ‘ukulele players. Also, there will be free ‘ukulele lessons and ‘ukulele displays. There will also be giveaways by ‘ukulele manufacturers, food booths, and Ukulele Festival souvenir T-shirts add to the festive atmosphere. Ukulele Festival Hawaii is a non-profit charitable organization established in 2004 by Roy and Kathy Sakuma. The organization’s mission is to bring laughter, love and hope to children and adults throughout Hawaii and the world through the music of the ukulele. Ukulele Festival Hawaii produces, promotes and arranges ukulele festivals free to the public, encourages interest in Hawaii’s arts and culture through education and scholarships, and promotes local and international interest in the ukulele as an instrument of virtuoso quality. The Ukulele Festival, the first and original ‘ukulele festival begun in 1971, is held every July in Kapio‘lani Park, O‘ahu. For more information, visit www.ukulelefestivalhawaii.org. Ukuleles are an important part of Hawaiian culture. If you’re interested in learning more about the culture of Hawaii, book a Hawaii Culture Tour through Hawaii Aloha Travel. Offered on Oahu, this tour will immerse you in Hawaiian culture and history. Especially important is that you will have a local tour guide who cannot wait to share their knowledge with you. What better way to learn about Hawaiian culture? First, you will visit a fishpond to learn about how ancient Hawaiians used the fishponds to trap and catch fish. Then, you will head to a rock formation known as Pele’s Chair, as well as Koko Head. Here, you’ll learn about the history, cultural significance, and local lore surrounding the “chair” that overlooks the ocean below. After that, you will also visit an ancient Hawaiian temple, Iolani Palace, and other important cultural sites in Hawaii. So give us a call today to reserve your spot!